Winelands Textiles (Pty) Ltd – t/a Hextex was founded in Worcester in 1946. The town is situated 110 km north of Cape Town, South Africa. The Hex River Valley to which Hextex owes its name, is surrounded by majestic mountains and is central to a fruit and wine farming community. All activities of worsted fabric production are executed on the one site starting with the intake of raw material in wool top form through to the finished fabric ready for the tailoring trade. South African Merino wools ranging from 17.5 to 24 micron are used. 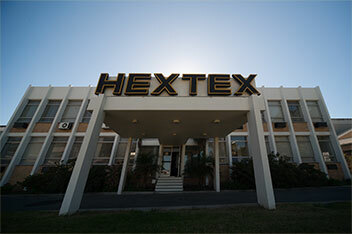 Hextex also has a fully functional knitting plant. Computerized Shima Seiki, CMS and Stoll machines can manufacture 3gg, 5gg, 7gg, 10gg and 14gg knitted fabrics and garments in high volumes. Various counts of yarn is produced and stocked. Ranges include wool/wool blends, cotton/cotton slub and high bulk acrylic/acrylic blends. Hextex is an ISO9001 listed company.